Most of the world has been watching with great angst as the economic markets fall and struggle to recover. Many companies and individuals have experienced losses of a magnitude that shakes their very existence. By all indications these economic struggles will be impacting virtually all aspects of life, even more than has been felt all ready. World and national leaders are seeking to reassure as they try to set a course through stormy and uncharted waters. It would be unwise not to be paying attention to all that is happening in a false hope that we might be unscathed. It would be even more unwise to make all the news and speculations the main source of our decisions, our hopes or our fears. It has been said that Wall Street is driven by two main forces: greed and fear. We need to pray and ask God to show us the wisdom of those motivations. And, amidst the angst and gnashing of teeth, we need to stop and listen to the Good Sheperd as He calls us to come to the Feast. Our Sheperd King calls and would lead us from and through the strife and chaos of this world to the timeless feast of God’s Kingdom. Scripture shares this invitation to the Great Wedding Feast of the Church and her King that will culminate for all eternity upon His return. 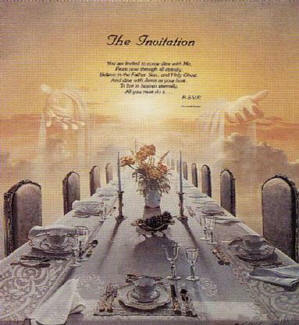 But we must realize that the invitation, this Feast is celebrated even now, this side of eternity every time we gather around the table of the Lord. It is there we received and share the riches of Christ’s Kingdom, His Word, His sacred Body, His holy Blood. It is also important to realize that we are called to a wedding feast, a feast of love. We are not called to some worldly victory feast, or some political event. We are called to a feast of the holy redeeming love of our Savior. This timeless wedding feast of holy love is set upon a mountain, the holy mountain of God. Scripture teaches of numerous mountains of God. We remember Mt. Sinai where God’s Law was given, Mt Tabor where Christ shared the principles of the New Covenant. We know of Mt. Zion, Jerusalem where the Holy Temple, the City of God is shown in type. Yet all these mountains lead the people of faith to the pinnacle of God’s mountain, to a humble hill called Golgotha where we come to the Cross. It is at the Cross that we are brought to the holiest Feast of Mercy, the Body, the Blood of Christ shared for us, shared for His Bride. And it is the voice, the Word of our Sheperd King that calls us to His Feast. With all the clamor and cries of fear and worry being heard in this time it is vital we heed and listen to the Word of God, the Truth and Light that will not diminish or change. It is His call that will bring us to that abundant Table set in the presence of the enemies of fear, doubt and worry. It is to this Feast, called by our King that we are brought to stand before His Presence. The Gospel for today would warn us that we cannot be as the guest who bothered not to wear the wedding garments. So it is for us, we must not neglect to robe ourselves with the beautiful robes of Christ’s mercy and humilty, love and grace that He so abundantly provides. God has provided. Let us avail ourselves of these garments of the Kingdom. We will know the riches of His grace to the degree we open our hearts and hands for Him. St. Paul in his letter to the church at Phillipi reminds us that our God shall supply all our needs according to His riches in glory. This is not about our wants..it is about our needs, what we need to live for and serve our Lord. It is about what will bring real and true fullfillment in our lives for all eternity. It is in the riches of God we realize our worth, our security, our value as a person is not in our posessions. They comprise a very small fraction of what we are about. It is in God’s wealth we discover ours. It is in the King’s Presence we discover the wealth and beauty of the soul God created. You are about so much more than anything you wll ever accumulate. And it is as we give of ourelves we learn and expereince the security of the Promises of God. We learn that we can never out-give our God. We live at a time of intense and difficult news. We may feel called to join the chorus of world fear and woe. Yet amidst the din Christ will lead all who seek His Kingdom through the strife and sorrow to the holy mount of His grace, to the timeless feast of His holy mercy and love. Our Shepherd Kig will lead us to His Cross.